It is a well known fact that e-commerce store visitors are discouraged from buying online when they have to browse in many different categories and sub-categories of an e-store in order to find what they are looking for. To overcome this problem Magnet Commerce comes with a powerful filtering technology, similar to Amazon's, eBay's, Yahoo's, Froogle's and MSN's, to help your visitors quickly find exactly what they want. Your customers will be able to reach the products that meet their demands by placing a specific query based on the filters you will have defined for your product search. Product filters can vary depending on the sort of products you provide on your e-store. For example, if you are selling TVs, your filter specifications could be any of the following: "Manufacturer", "TV price", "Diagonal screen size" and more. This way a customer that is looking for a Sony TV set in the price range of $2000-$5000 can get all the possible choices immediately. Figure: e-store front end: The list of filters defined for the "TV & Video" category appears on the category's page. When a customer chooses to see all the products under $2000, the "TV price" filter disappears from the previous list and only the products costing less than $2000 remain available. 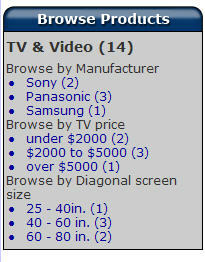 Figure: e-store front end: Choosing to see all the products under $2000 makes browsing by TV price unavailable. Defining your filter specifications is a straightforward procedure and you can have a successful product filter running in a matter of minutes. 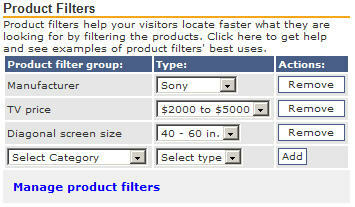 The easiest way to start setting up a filter group is by clicking "Catalog > Product Filters". Figure: Setup your Product Filters by choosing "Catalog > Product Filters" in the Administration Panel. Firstly you need to click the "Add New" button and type in a name for this new filter group. Put in something that is very clear about what you're trying to offer and easy for you to remember its definition. 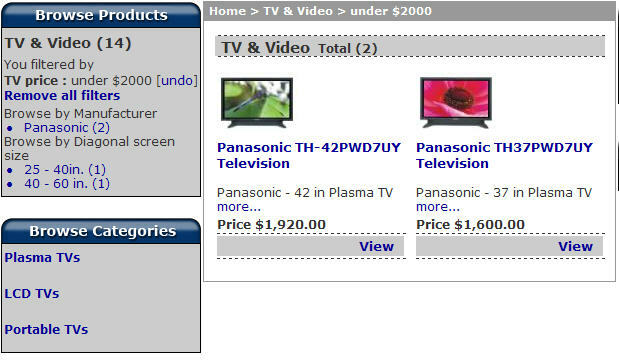 Simple names are easy to remember later on when adding them to your pages, so for selling TVs "Manufacturer" and "TV price" are good examples. In this case we will type "TV price" and click the "Add Group" button to create the group. As a note you are not creating this filter group for one page, you can use it in any of the Catalog pages you need to apply it in. It's a multipurpose selection. 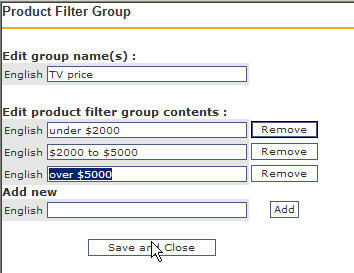 Figure: A new filter group named "TV price" has just been created. Now that we have the group name we need to add the available TV price ranges to this group. To do this, simply click the "Edit" link. You would normally start with the smallest price, so you could type something like: under $2000/$2000 to $5000/over $5000. There is plenty of space for typing so keep it as clearly defined as possible. You simply enter one filter value at a time and click the "Add" button to make it active within the list. When you have added all your options, check to see that you have clicked the "Add" for the final option before you click the "Save and Close" Button to finalise your details. Figure: Adding Filters to the "TV price" group. Now that completes one part of the needed information, and your option appears in the list. You can carry on adding more options if you need to, or come back at any time to create more product filter options as the need arises. The possibilities are endless, and it comes down to what products you sell, and how you want to market them. Figure: Defining Filters for a product. Figure: Defining Filters for a Sony TV set with a 50 in. Diagonal screen size that costs $2499. 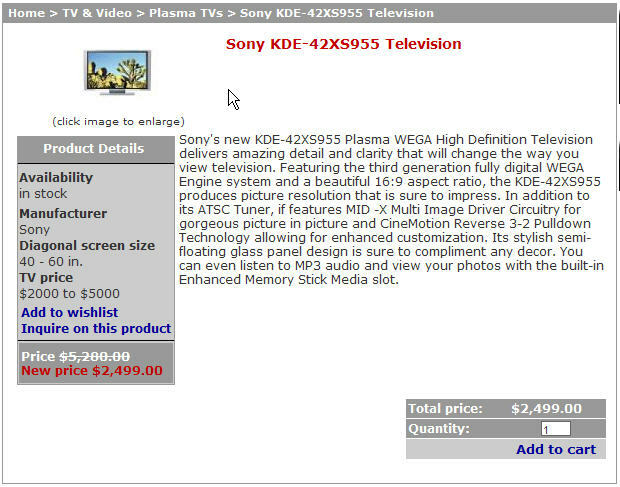 Figure: Storefront product page of the Sony TV set, after assigning all filters. Also remember that you are not creating a Filter Group for one page, but you can use it in any of the Catalog pages it applies to. Your selection of Filter Group is a multipurpose one. The following is an example of Product Filters used for a range of TV products. As seen in the figure different Filters of the "Manufacturer" Filter Group are assigned to different products. If you are also selling Sony cameras, this Filter Group can be used for these products as well. 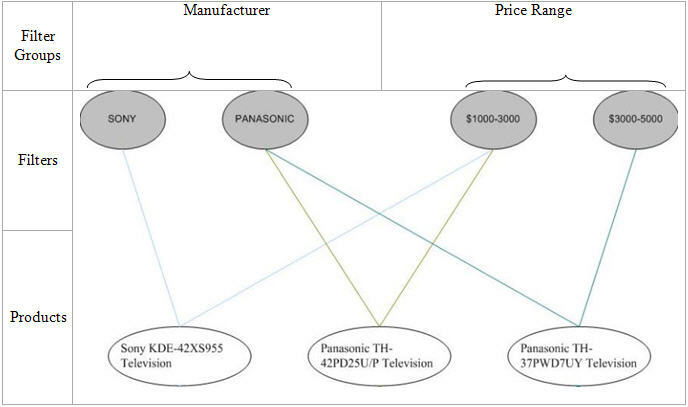 Figure: Filters related to a TV product range. Click the "Add new" button to create a Filter group. List each Filter in turn and click "Add" after each item, when all your items are complete, click the "Save and Close" button. When adding a new product define the appropriate Filters for it in the "Add Product" page. Use the appropriate names for your Filter Groups to make sure customer search is fast and effective!